Tax Freedom Day® 2012 arrives on April 17 this year, four days later than last year due to higher federal income and corporate tax collections. That means Americans will work 107 days into the year, from January 1 to April 17, to earn enough money to pay this year’s combined 29.2% federal, state, and local tax bill. If the federal government raised taxes enough to close the budget deficit—an additional $1.014 trillion—Tax Freedom Day would come on May 14 instead of April 17. That’s an additional 27 days of government spending paid for by borrowing. This year’s federal budget deficit remains high, though it has declined slightly over the past two years. As the economic recovery continues, the growth in individual incomes and corporate profits will increase tax revenues and push Tax Freedom Day ever later in the year. The latest ever Tax Freedom Day was May 1, 2000—meaning Americans paid 33.0% of their total income in taxes. A century earlier, in 1900, Americans paid only 5.9% of their income in taxes, meaning Tax Freedom Day came on January 22. Tax Freedom Day is a vivid, calendar-based illustration of government’s cost, and it gives Americans an easy way to gauge the overall tax take. Conceived by Florida businessman Dallas Hostetler in 1948, he deeded the concept to the Tax Foundation upon his retirement in 1971. In 1990 sufficient data became available to calculate a separate Tax Freedom Day for each state. We assume that the nation starts working on January 1, earning the same amount each day and spending nothing. When the nation has finally earned enough to pay all the taxes that will be due for that year, Tax Freedom Day has arrived. This year, Americans will pay $2.62 trillion in federal taxes and $1.42 trillion in state-local taxes, for a total tax bill of 29.2 percent. The federal tax burden never returned to pre-war levels. The fifties and sixties also saw a rise in state-local tax burdens and a boost in economic growth following the 1964 Kennedy/Johnson tax cut. Vietnam War-era tax increases and the “stagflation” of the 1970s pushed personal incomes into higher tax brackets, and by 1981, Tax Freedom Day arrived on April 24. The Reagan tax cut signed into law that year ushered in an economic boom; federal revenues grew but the economy grew even faster. Despite pressure on state and local taxes following taxpayer revolts like Proposition 13 in California, the strong economic growth led to increased tax collections, and in 1989, Tax Freedom Day arrived on April 22. That year, federal income tax revenues as a share of the economy were higher than they had been in nearly all years prior, when the top rate exceeded 90 percent. A string of record-setting federal tax burdens followed, and the latest ever Tax Freedom Day occurred on May 1, 2000. With federal revenue routinely exceeding even its own forecasts, there was strong popular pressure for a major tax cut. The new president delivered on his tax cut promises, which, combined with a recession in 2001, caused the tax burden to fall considerably. In 2003, Tax Freedom Day arrived on April 14, more than two weeks earlier than it had in 2000. 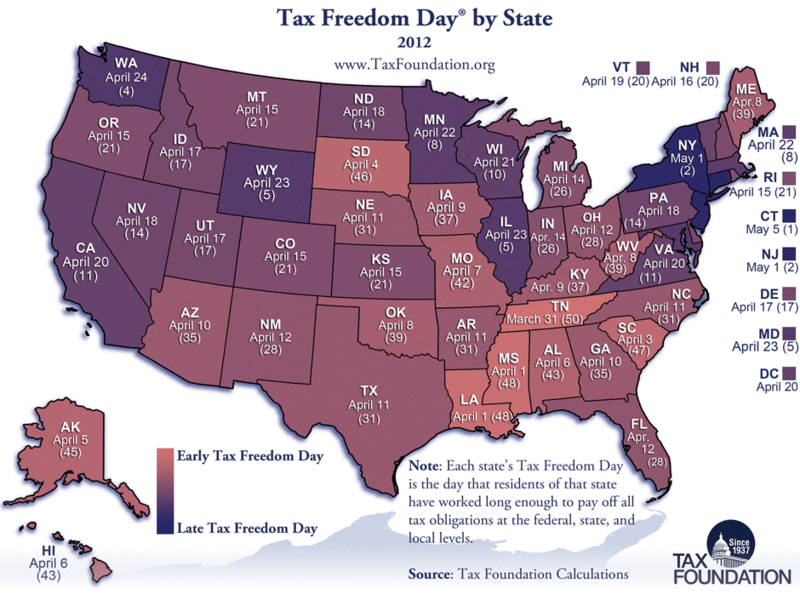 Since 2007, stimulus tax cuts and a weakening economy have pushed Tax Freedom Day earlier still. In 2009, Tax Freedom Day was on April 10, earlier than any time since Lyndon Johnson was in the White House. Meanwhile, government spending rose, leading to a large gap between revenue and spending. This year marks the fourth year in a row of the federal budget deficit exceeding $1 trillion. The total tax burden borne by residents of different states varies considerably, not only due to differing state tax policies, but also because of the steep progressivity of the federal tax system. This means higher-income states celebrate Tax Freedom Day later: Connecticut (May 5), New Jersey (May 1), and New York (May 1) residents face a significantly higher total federal tax burden than lower-income states. Residents of Tennessee will bear the lowest average tax burden in 2012, with Tax Freedom Day arriving for them on March 31. Also early are Louisiana (April 1), Mississippi (April 1), South Carolina (April 3), and South Dakota (April 4).